To get the look, Cardona suggests starting with damp hair, so you can give yourself a fresh, smooth, frizz-free blowout. Spritz your hair with a heat protectant, then point the nozzle of your blowdryer downward, brushing through the hair section by section as you dry. 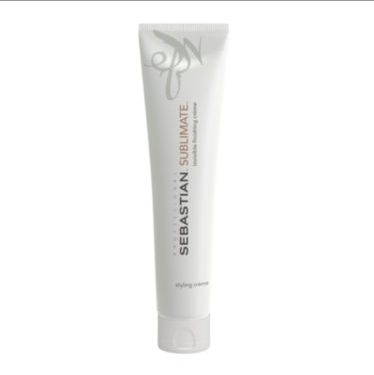 Next, rub a quarter-sized amount of finishing crème, like Sebastian Professional Sublimate, between your palms and smooth the hair into a low ponytail. (For an extra-sleek look, you can flat-iron sections, applying a bit of Sublimate both before and after.) Feel free to be generous with the crème — you can use it to tame flyaways, control your hair, and/or make sections more piece-y, says Cardona. Then, make your ponytail more stable by using bobby pins as support — insert a pin on each side of your elastic, pushing them in toward the center. Once they're completely lodged in, wrap pieces of your hair around the elastic to hide it. Now comes the tricky part, so stick with us — we promise it's easier than it looks. Take your ponytail and flip it upward toward the top of your head. Slide in some extra-long bobby pins horizontally, securing the piece of hair just above the elastic. Next, take an accent piece, like black ribbon or a strip of leather, and slide it down so it's settled right above your bobby pins. Leave it there for the time being. Take the remainder of your ponytail and bend it back downward, creating an upside-down U-shape. Continue looping back and forth until you reach the end of your pony. Then, wrap your accessory over the entire piece so it forms a band and secure it tightly. Run a flat iron through the ends of your pony and spray the style generously with hairspray. See? Weren't those extra 10 minutes worth it? Jonathan Simkhai top, Dion Lee top, Eva Attling earrings.